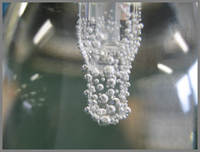 Bubbles attached to the responsive portion of an electrode may cause variations in readings or lower the repeatability of results. Thus, you need to observe the surface or liquid junction of the electrode during measurement and remove bubbles attached to the electrode by giving the electrode a quick shake or by other means. For carbonated water or other samples that continuously generate bubbles by nature, you can measure the pH in a stable manner by removing small scratches on the surface of the responsive glass membrane, which do not affect measurement but to which bubbles easily attach, by using an alkaline solution. Soak the responsive glass portion in an alkaline solution (ethanol saturated with potassium hydroxide) for about 10 minutes. Wash the soaked portion thoroughly with pure water. 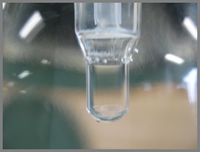 By soaking the responsive glass portion in an alkaline solution to remove small scratches on the glass surface and make the glass surface hydrophilic, attachment of bubbles to the surface can be restrained. 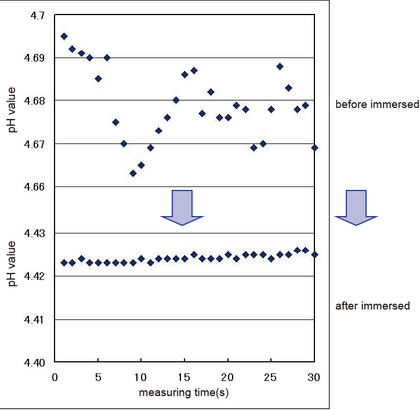 Table 1 and Figure 2 show electrode response and variations in pH readings, respectively, before and after the responsive portion was soaked in an alkaline solution. Before it was soaked in an alkaline solution, the range of variations among three measurements was large with variations in pH observed in a range of 0.03. On the other hand, after it was soaked in an alkaline solution, variations in pH were observed in a range of only 0.003. This indicates that the range of variations among three measurements was able to be narrowed by soaking it in an alkaline solution. Immersed into alkaline solution SODA water measurement（pH） Ave. This indicates that stable values can be obtained by soaking the responsive glass portion in an alkaline solution to remove small scratches. This method can be used with carbonated water and any other samples that generate bubbles.